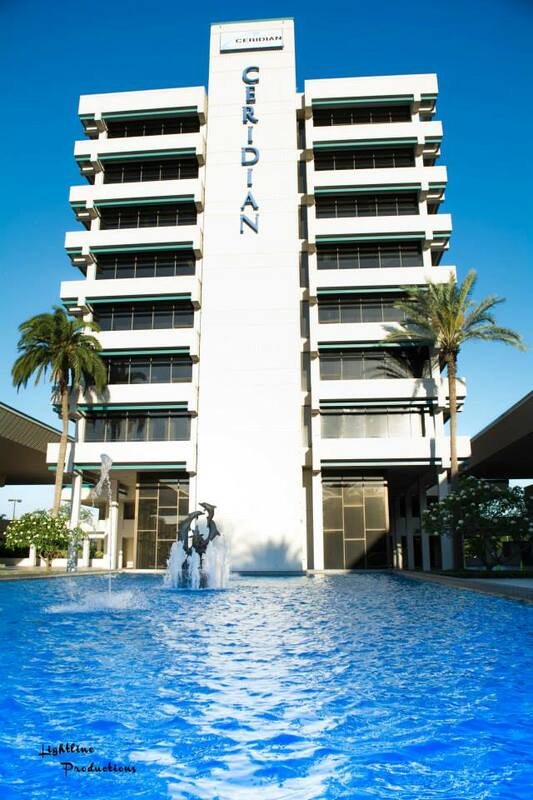 The Skyway Marina District Inaugural May Day Races and Family Festival was hosted and sponsored by Ceridian, a human resources corporation in St. Petersburg. 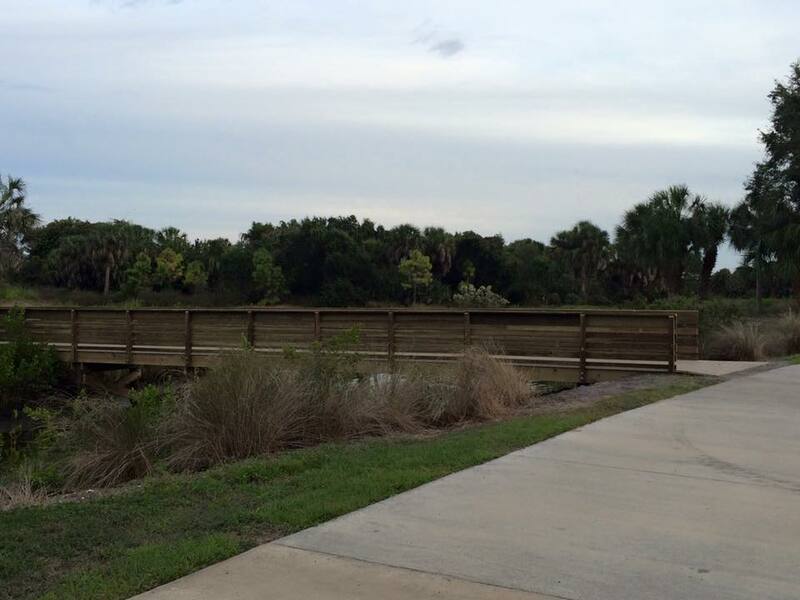 The 5K and 10K races began and ended on the Ceridian campus, which is next to the Skyway Trail and Clam Bayou Nature Preserve. Ceridian employees could participate for free. The race was open to the public for a fee. Walkers were encouraged to enjoy the course after runners finished. There was a May Day Festival from 9 a.m. to noon with free activities and vendors. Packet Pickup: Yes. Packet pick up was available at two locations before race day, or at the race. I picked up my packet on Friday afternoon at Fit2Run in downtown St. Petersburg. No expo prior to the race. There was a Family Festival on site after the race. 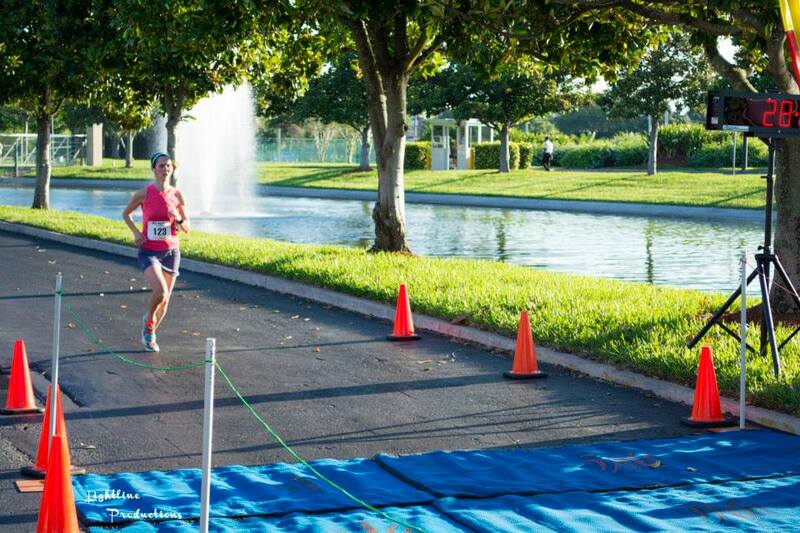 Race Course: The 10K course began at the edge of the Ceridian campus. We ran a few steps under mature shade trees and then jumped onto the Skyway Trail. 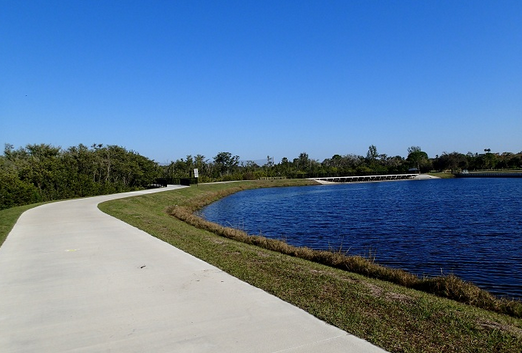 After we went out and back through Clam Bayou Nature Preserve, the 10K followed 37th Street south to about 53rd Avenue S. We turned around, and ran 2 miles back to the Ceridian campus. 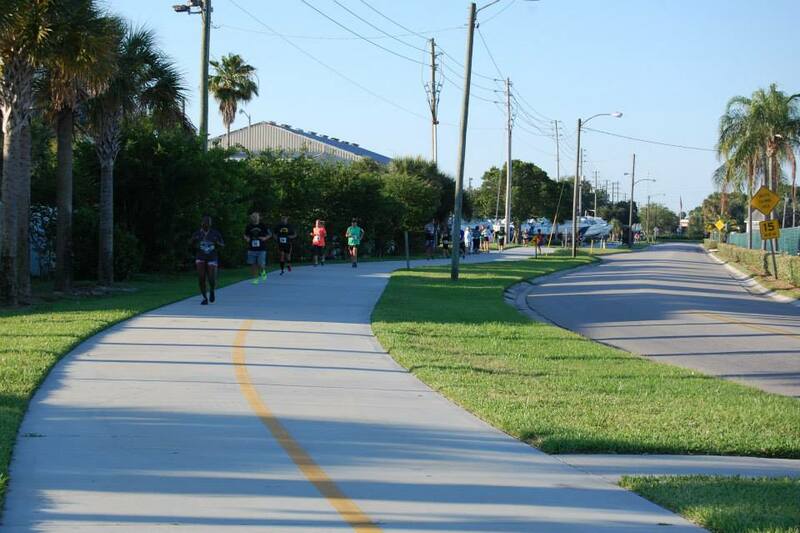 The entire race was on paved trail or sidewalks. As we ran through neighborhoods, I saw more than a few early morning walkers surprised to find a hundred runners joining them for their morning stroll. "What's going on?" an older man asked me. I smiled and said, "You're in the middle of a race!" Volunteers and police officers along the route were friendly and cheerful. Special thanks to the woman bicyclist escorting the lead runner — she was happy and encouraging each time I saw her. Timing Chip: Yes. Separate unit attached to your shoe with a zip tie. Digital display at finish line. Race Results: Results were online at CoolRunning.com at 10 am when I checked. Aid Stations: Yes. There were 2 water stations for the 5K, and 4 for the 10K. There were three port-o-lets in the parking lot near the starting line, and permanent restrooms inside the Ceridian building next to the flag pole plaza. The 5K race had about 300 entrants, and the 10K race had about 100. The longest line I saw was 40 minutes before the 10K start, and that was 8 people deep waiting to use three port-o-lets. The 10K race began 15 minutes before the 5K, so I don't know if the lines were longer later. Parking: Parking was FREE in the Ceridian parking lot on race morning. The only note is to get there early because the parking entrance is closed during the races. SWAG (Stuff we all get): The goodie bag included an excellent shirt, a koozie, stress relief ball, collapsible water bottle, pen, 30-day membership to Anytime Fitness, and race flyers. There was a brochure on the Skyway Marina District. It was a nice goodie bag for an inaugural event. Happy Surprise: Just past the 4 mile marker I heard excited voices ahead of me. Two smiling and energetic ladies at the turnaround clapped, cheered and ran with the runners to keep everyone motivated. They were the perfect shot of encouragement. "Just 1.92 miles left! You can do it! You've got this! Post Race Festivities: The timing chips were on our shoes, so as runners crossed the finish line a volunteer removed the chip. Other volunteers handed runners their medals and a bottle of cold water. There was a box of bananas and a pile of granola bars on the post-race food table when I reached it. I glanced around for more and spied a plastic container with five individually wrapped pineapple slices in the shape of a flower from Edible Arrangements in it. I grabbed one. It was on a stick, so it was easy to eat. It was deliciously different post race food. There was evidence (two empty Dunkin' Donut boxes and a few cream cheese containers) that I missed the bagels and donuts. A Kahwa Coffee truck was parked in the parking lot, but I didn't visit it. I walked around the festival area where a bounce house was going up. There was yoga on a grassy area. I won a purse holder by throwing a ball at a target. City of St. Pete table gave me a magnet. Photos: No race photos offered — that's not unusual for a small inaugural race. Awards: The overall winners were crowned May Day King and Queen. Prizes were given for age group winners. Weather Report: The temperature was 66 degrees at the start. There was a breeze throughout the race, at times it was a strong headwind, but most of the time it was pleasant. Clouds came and went. There wasn't much shade along the Clam Bayou trail, but there were mature trees and shade from tall condos along 37th Street (miles 4 to 5.5). The half marathon I ran in March had much hotter temperatures. 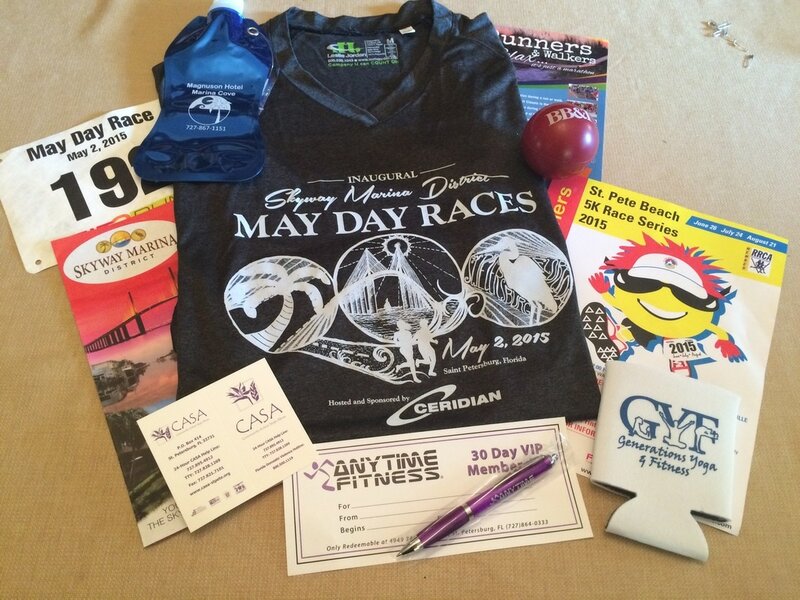 Runners received a goodie bag that included a short sleeve tech shirt. 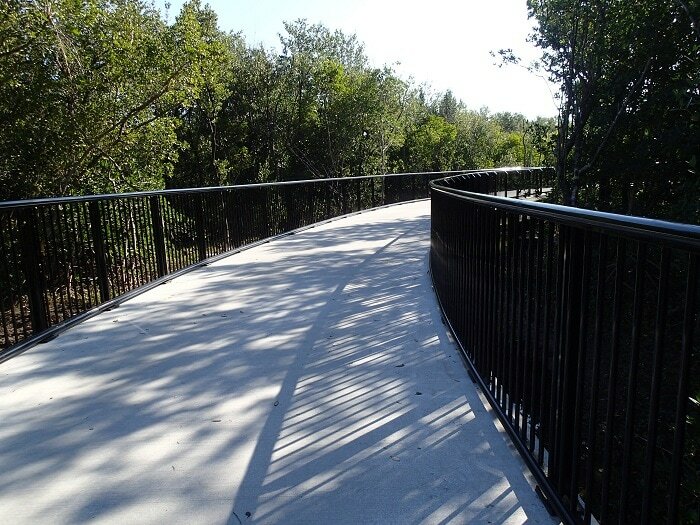 Paved trail in Clam Bayou Nature Preserve. Scenic Clam Bayou Nature Preserve. 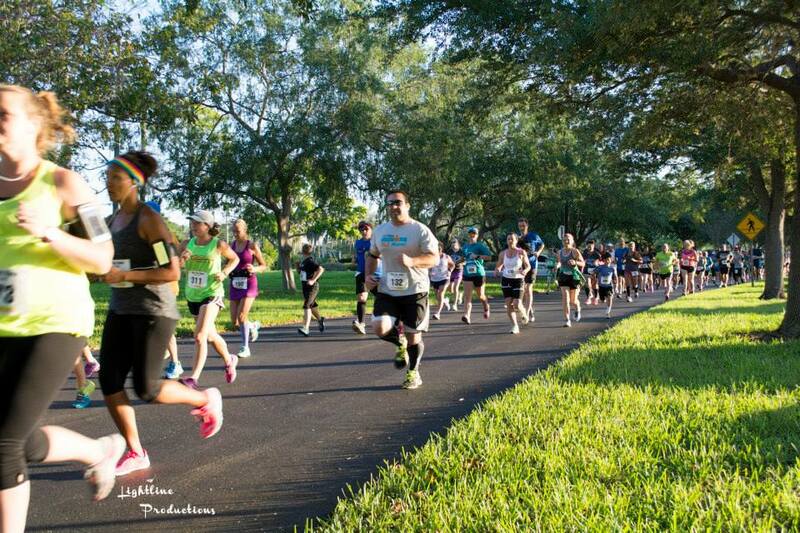 10K racers on the Skyway Trail in St. Petersburg. 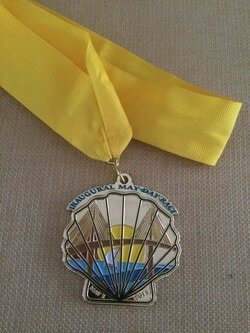 The 2015 Inaugural May Day Race medal was given to 5K and 10K finishers. Donuts and bagels were gone when I reached the finish; there were plenty of runners behind me. 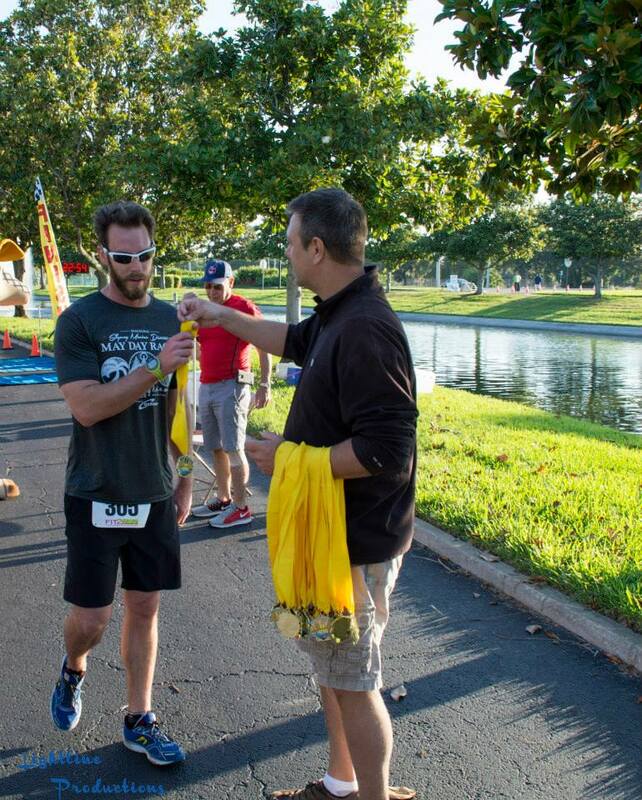 There were a couple of pineapple flowers left when I reached the finish line, so I grabbed one. Delish. There was a slight incline on this Clam Bayou Nature Preserve trail over the water. Inaugural races are fun because they are uncrowded and on a new route. I enjoy smaller races where you can run without packed corrals, and obstacles like strollers, or three across walkers. My perceived challenge pre-race was the weather, but that obstacle disappeared with low humidity and temps in the 60s. The scenery in Clam Bayou Nature Preserve is lovely. There were encouraging signs posted throughout the race that made me smile as I ran. The starting ceremony and post race vendor areas were awkward, but I'm sure things will improve with experience. 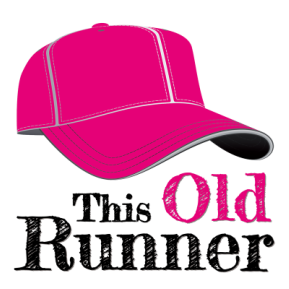 I will happily run this race again. My only suggestion is more post race food — more fruit and less crunchy granola bars. Extra points for the Edible Arrangements fruit.